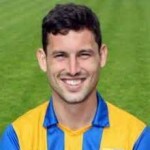 Margate have signed Mansfield Town defensive midfielder Jamie Hand on loan for the rest of the season. The Uxbridge born 29 year old started his career at Watford in 2001 where he went on to make 55 appearances. His career then took in loan moves at Oxford, Livingstone, Peterborough and Northampton. He then went on to play for Chester and Lincoln cities before joining Ebbsfleet United after another period on loan at Oxford, and having made around 150 appearances in the Football League. He then had brief spells at Chelmsford, Woking and Hemel Hempstead Town before signing for Hayes and Yeading in the Conference Premier. After a loan spell at Luton Town he signed for the Stags in the summer of 2012, but injury has curtailed his appearances for the Conference Premier title chasers. He has most recently been on loan at Blue Square Bet South Eastleigh. As well as a ball winner, Jamie is also renowned for his passing ability. This entry was posted	on Saturday, March 9th, 2013 at 4:45 pm	and is filed under Football, Non-League Football. You can follow any responses to this entry through the RSS 2.0 feed. Both comments and pings are currently closed.